Newmarket Jogger Elke Hausler had a successful week in Toruń, Poland, where she was representing Great Britain & Northern Ireland in the World Masters Championships, which included male and female veteran athletes of all age groups from 35 upwards. She set herself a new 10K PB of 43:21, coming home 6th of 18 in her W55 age category and earning an impressive 85.1% age grade, which puts her into the exclusive Newmarket Joggers Sapphire+ club standard (85%+), alongside ace veteran Paul Holley. She also competed in the W55 3000 metre indoor event, finishing 8th of 15 in 11:48.75 and 8th of 23 in the W55 8K Cross Country, clocking 39:06. On Friday evening, Adam Maltpress (48:14) and Sianie Painter (1:02:30) took part in the 10K Night Trail Run through Thetford Forest, which began in the dark at 8:00pm. Head torches were essential to avoid tree roots and other hazards and it was certainly no 10K PB opportunity. Both were well up with the pace, with Maltpress 37th of 424 overall and Painter 71st of 217 female participants. On Saturday, Clive Purbrook (1:01:17) and Belinda Schofield (1:11:45) both competed in the Nelson Knee-Knobbler 10k race at Caister-on-Sea. 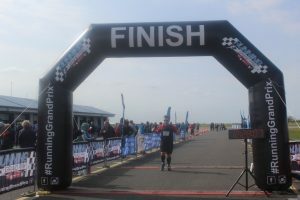 This race was the first of a new 2019 series of three events, run over 5K and 10K/11K distances on energy-sapping beaches and sand dunes along the Norfolk coast. The next is at Winterton-on-Sea on Sunday 28th July. 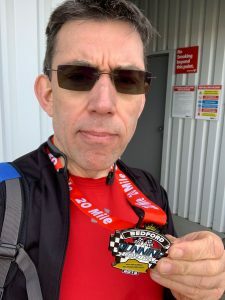 On Sunday, four Joggers travelled to Bedford Autodrome for the Running Grand Prix event, which entailed completing a certain number of 3 mile laps around the motor racing track with adjustment loops for the exact distances. It was cool and sunny but the brisk east wind was challenging on stretches of the exposed terrain and made pacing difficult. Andrew Taylor (46:24) went for the 10K event and finished 49th of 322 overall, while Adam Maltpress (1:49:21) was 49th of 164 in the Half Marathon. Giles Macrow (3:12:58) and Chris Aylmer (3:31:58) both opted for the 20 mile event as practice for pending marathons, coming home 71st and 115th respectively of 173 overall. Giles finishing the Bedford 20 and with his medal. Next stop London Marathon, 28th April!